Shorebird season is in full swing right now and for my money, there is no place finer to observe the summer staging of sandpipers, dowitchers, and plovers than Jamaica Bay Wildlife Refuge. Apparently, I’m not alone in this assessment judging by the outstanding turnout at Jamaica Bay’s 2nd Annual Shorebird Festival. This superb event, the only bird-themed festival I’m aware of in New York City, combines incredibly indistinguishable avifauna with experts actually capable of distinguishing them. Not only were prominent NYC naturalists like Don Riepe and Lloyd Spitalnik leading groups, but the coauthor of the current North American shorebirding bible drove up from Cape May to share his esoteric wisdom; Kevin Karlson of The Shorebird Guide fame added an element of celebrity to the proceedings, but the birds themselves were the stars, which is saying something considering how subtle and brown these species are! Over 80 attendees including Corey and I warmed up with common shorebirds on the south end of Jamaica Bay’s East Pond, that hidden marsh frequented only by birders and madmen. On the breakfast menu were peeps, not the marshmallow kind of course but rather an assortment of virtually inseparable shorebirds. 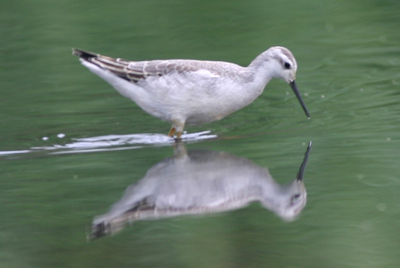 These members of the genus Calidris are all small, short-legged, and daubed with similar plumage of brown and gray. In addition, they all frequent mud flats in search of the same food. 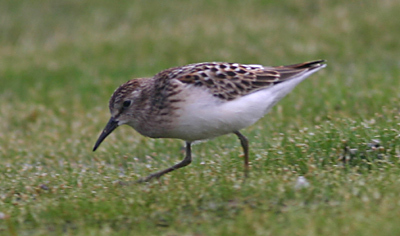 Traditionally, the five species of peeps in North America are Bairdâ€™s, Least, Semipalmated, Western, and White-rumped Sandpipers. From one spot, we could observe all but Baird’s, which is extremely rare in the northeastern United States. Thanks to our knowledgeable leaders, I finally learned how to distinguish white-rumps from other peeps, no mean feat indeed! 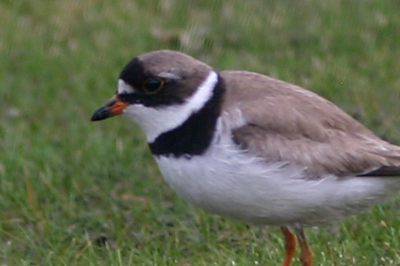 The southern stretch of the East Pond also served up healthy portions of plovers (Semipalmated and Killdeer) and yellowlegs (Lesser and Greater). Also appearing were Mallards, Canada Geese, Mute Swans, Glossy Ibis, and a variety of terns and gulls. Such common fare, however, could not long sustain shorebird aficionados so a considerable portion of the group peeled off to brave the north end of the pond. Six inches of swamp muck stood between us and our quarry but I don’t think six feet of the ripe, oily mud could have deterred this contingent from the possibility of Wilson’s Phalarope, a displaced and desirable species. We encountered one of the three phalaropes present as soon as we plunged through the phragmites much to Corey’s delight, as he needed Wilson’s for his Big Year. Having spent a lot of time scrutinizing this species with Amy at San Joaquin Wildlife Sanctuary just last month, I was more excited about the Sora that lurked in the shelter of the reeds about forty feet away. Still, the phalaropes were fun to watch as they zigged about the shallow water. Once everyone was sated with Sora and phalarope sightings, we moved on to the main course, a feast of peeps, plovers, and special sandpipers. First came dowitchers, most or all of which were Short-billed. I pushed past them to lay eyes on my life Stilt Sandpipers. A number of juvenile stilt sands, as the cool kids call them, worked the shallows close enough to yellowlegs that the modest differences in their respective plumages were readily apparent. Even better, Kevin, promoting the practice of birding by giss (General Impression of Shape and Size), pointed out how the two sandpipers could be distinguished by the way they carry their bills while feeding. Fascinating! Also of more than moderate interest was the lone Pectoral Sandpiper that popped up fairly close to our firing line of scope-wielding fanatics. I missed pec sand (more birder lingo) at Montezuma last week and thus was well pleased to peruse this very handsome shorebird. Okay, so you did get a better pharalope pic than I did! I’ll mark it on my calendar for next year!